A healthy treat to replace the more waist-unfriendly treats! As the holidays approach, we are going to see tons of pumpkins everywhere! Not just the pumpkins that we carved for Halloween, but the pumpkin temptations that we are just longing to eat: pumpkin pie, pumpkin spice lattes, pumpkin muffins, cookies, cakes- it’s definitely pumpkin season! With that, a lot of these treats are often served at family and friend gatherings during this time of year. Why? They are nostalgic, tradition and delicious! The only issue is that they typically also contain excessive calories that we just don’t want or need. What to do? (I think we know the answer by now…) I’m here to help you out! I’m providing you with a super simple, healthy treat that you can serve to family and friends in place of the more waist-unfriendly treats. You will still have all of the flavors of the season without the added calories, fat, sugars, etc.! This delicious Pumpkin Pie Yogurt Parfait combines the creamy, rich texture of Greek yogurt, with the spicy pumpkin pie mixture, layered with crunchy granola … it is a perfect pumpkin pie parfait (say that ten times fast)! What’s more? It has only 2.5 grams of fat, fewer than 300 calories and 10 grams of fiber! Keeping our bodies in shape is hard work … and, yes, it absolutely does mean making sacrifices when it comes to the foods that we choose to eat! However, the key is to still enjoy the foods that you love by simply recreating them into a healthy version. That’s what I’m here for! I’ll take the guesswork away from you and bring you new recipes each and every week! It’s all about being creative with good-for-you foods! As my trademark proclaims, I will always do my best to deliver to you: 100% Taste, 0% Guilt! 1. Combine pumpkin, vanilla, cinnamon, spices, salt and stevia in a small mixing bowl and stir well until all ingredients are well blended. 2. Spoon 1/3 of the pumpkin mixture into the bottom of a tall tumbler (or tall clear glass). 3. Next, layer on 1/2 of the yogurt. Repeat with another 1/3 of the pumpkin mixture, followed by the remaining yogurt, and then the remaining pumpkin mixture. 4. 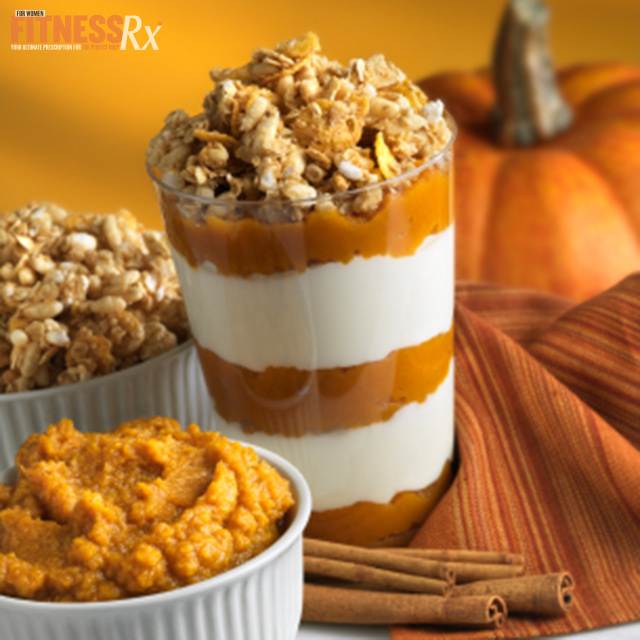 Lastly, scoop the granola onto the top to finish off this delicious pumpkin pie parfait! Note: You can whip out a bunch of these in a jiffy for a gathering, or you may simply combine these ingredients in a bowl if you are going for a less casual solo meal … either way, it tastes just as good! Per serving (1 parfait): 290 calories, 22 grams protein, 45 grams carbohydrates, 2.5 grams fat, 10 g fiber!